Piano Lessons Derby Review Yamaha CLP465GP Clavinova Piano with Real Grand Expression” Sound, touch, pedals–perfectly integrated to give you the sensation of playing a grand piano. Featuring ‘Real Grand Expression’ which defines the expressive capability of Yamaha Clavinova CLP 465. It is not only the full realization of the sound, the touch and the pedals, but the application of technologies nurtured by crafting acoustic pianos to perfectly integrate these three elements into a single piano. This piano produces that exact sound you want through the touch of the keys and the feel of the pedals. As you play, you will truly feel as though you are playing a grand piano. The sound is heard just as it was played. “RGE Sound Engine” provides playing response and expressive capability. he RGE Sound Engine delivers the ultimate expressive capability for the CLP Series. The new CLP Series uses the RGE (Real Grand Expression) Sound Engine, the next-generation piano sound source. It improves upon the Pure CF Sound Engine, which earned high praise in the CVP Series, and lets you enjoy the playing response and expressive capability of a concert grand piano. It features a new Smooth Release function which can express sound with great clarity, and clearly enunciate staccato notes with the sound of lingering resonance heard when gently lifting your fingers from the keys. 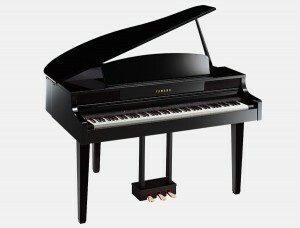 It succeeds in capturing the essence of a piano performance to create grand piano-like, richly expressive experiences. Dynamic change of sound is dependent on touch. An acoustic piano is a musical instrument whose sounds linger for a long period. The strength of touch varies not only the volume, but also the sound from bright to dark, creating rich expressiveness. Yamaha Clavinova CLP 465 Piano produces deep resonances by using piano sounds that have been accurately sampling for their entire length. Proprietary technology creates smooth and dynamic changes according to the strength of the touch. Additionally, to achieve a performance feel rivaling that of a grand piano, the touch was carefully refined by many pianists who played it and gave their feedback for Yamaha’s research and development. Piano Voices embody the careful attention only a piano manufacturer can give. The grand piano Voices of a Yamaha Clavinova CLP 465 were obtained by recording the sounds of a Yamaha concert grand piano that led to the creation of the CFX, the piano selected for a performance by the 2010 winner of the famed International Frederick Chopin Piano Competition. A single piano best suited for recording was selected and then tuned to the finest possible condition by a veteran piano tuner. All the sounds were recorded resulting in a sound that displays not only the beauty of each note, but the harmonized sound of a single piano. 128-note polyphony lets you play without notes dropping-out, especially in dense passages of music. When you play fast phrases or superimpose chords while pressing the damper pedal, you want to be able to perform without notes dropping out. The Yamaha Clavinova CLP 465 Piano provides 128-note polyphony so you can enjoy complex works such as those by Liszt or Ravel, which feature numerous pedal presses, with no limitations. As your playing improves over the years, your Yamaha Clavinova CLP 465 Piano will continue to let you make the most of your abilities. 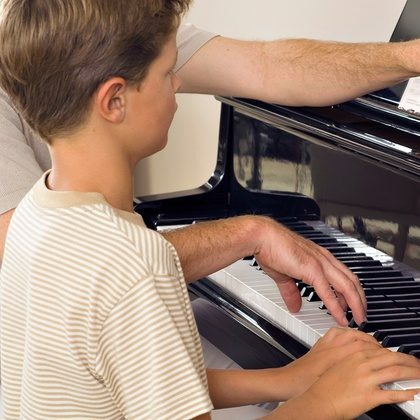 A superb choice of instrument for Piano lessons! Diverse piano voices that you can choose to match the piece you want to play..
Yamaha Clavinova CLP 465 Pianos are provided with distinctive piano voices in addition to the piano voices that offer playing response like that of a concert grand piano. These include a piano for ballads that gently resonates the start-up sound, a piano for jazz that adds depth to the sound, and a piano for popular music with bright, rich sound. To ensure that the sound conforms closely to the genre, adjustment of each piano voice focuses on the resonance, or the sound produced when you lift your finger, and other delicate nuances. Each time you play, you can immediately enjoy the perfect piano sound without having to make any adjustments. The “GH3 (Graded Hammer 3) keyboard” faithfully reproduces the touch of a grand piano. The touch of the Yamaha Clavinova CLP 465 Piano keyboard has been praised by pianists for a performance feel that makes you forget it’s a digital piano. The secret behind this superior touch is the same hammering system and spring-less mechanism as a grand piano. Depending on the weight of the hammer, the force of your touch and the natural key return when you release it, the Yamaha Clavinova CLP 465 Piano faithfully reproduces the keyboard touch of an acoustic piano from the heavy feel in the lower range to the light feel in the higher range. Also important is Yamaha’s unique three-sensor system, which accurately senses and interprets the behavior of the keyboard, just like a grand piano. When playing continuously or with a light trill, techniques used in many pieces such as Für Elise, you can play with a bright, vivid feel. At time of writing this review the Yamaha Clavinova CLP 465GP retail price is £3,544.00. Please visit Yamaha UK website for full specification details. ©2012 Piano Lessons Derby Review Yamaha CLP465GP Clavinova Piano.